Copper, it’s polished surface almost blinding in the Mexican sunlight, has been part of life in Santa Clara del Cobre since the Pre-Hispanic era, when the Purépecha people developed methods for using copper to create jewelry, vases, pots, axes, and innumerable other decorative and useful items. After the Conquest, the Spanish began mining the area, depleting the mines by the mid 20th century. 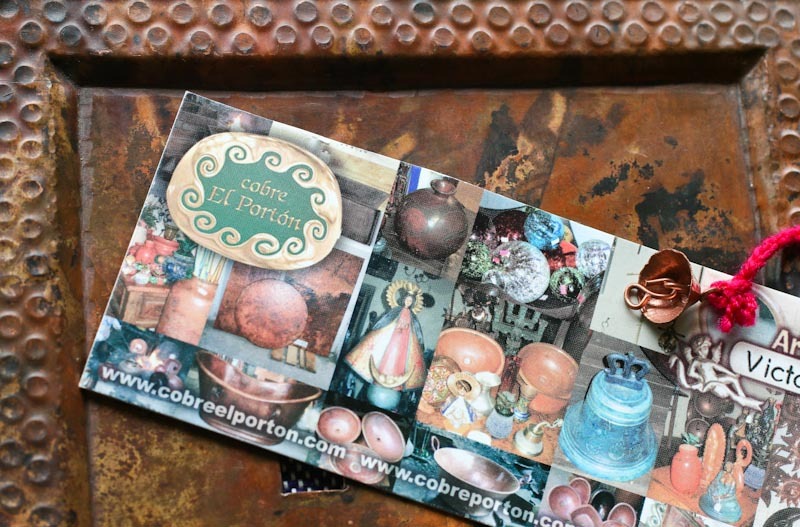 Today copper artisans hammer out a wide array of brilliant copper items from tiny pea-sized bells to entire doors, using mostly recycled copper cable from telephone and electric companies. Treasure box created with copper and silver inlay. 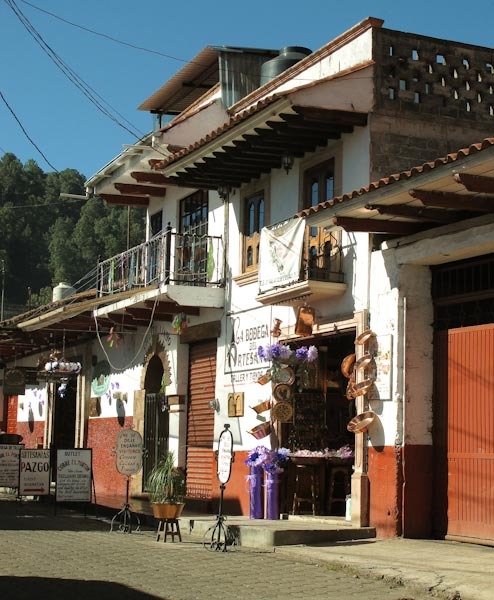 Knowledge of the traditional techniques has been passed down through families for generations, and more than 250 family workshops are scattered throughout the town of Santa Clara, located about 20 km from Pátzcuaro in the state of Michoacán. Craftsmen welcome visitors into their workshops to watch them transform a wad of used copper wire into a sink, a shining sun for the garden, or maybe even a bathtub! 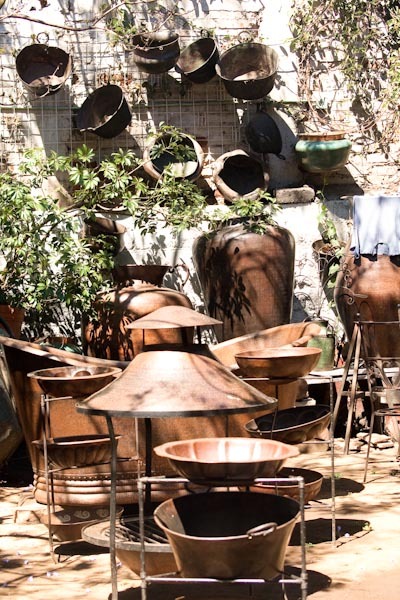 Gleaming pots surrounded the doorway of Cobre El Portón, and my admiration grew as I meandered through two large showrooms and a courtyard, all stacked with an amazing variety of copperware. Artisans spend their days in work areas behind the shops, imagining a form and then melting and hammering it into existence. The process of copper creation is described below. Click on any photo for a larger view and complete captions. The copper must be red hot! Three guys were hammering in sequence. Hey! careful with that sledgehammer! In one minute the disc cools and must be put back in the fire until red hot again, about 3 minutes. Worker hammers and bends the flexible copper into the desired shape. Using a ball peen hammer, craftsman is adding detail to what is probably a sink. Craftsmen repeat this process until the disc is the desired thickness, depending on the envisioned product. He then rests the disc on a metal rod that is buried in the ground and begins hammering it into the imagined shape. If a specialized tool is needed, he manufactures one for himself! 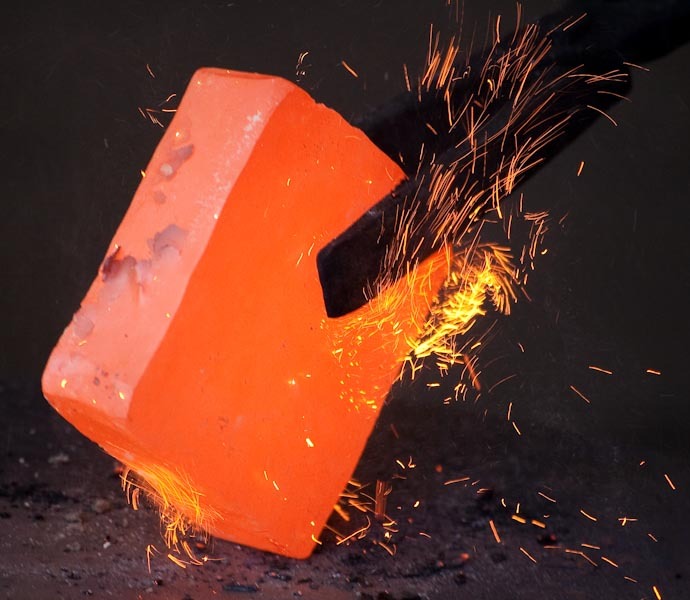 Ball peen hammers create a textured finish for sinks or pots. Acids and other treatments can change the color from glowing copper to green or shades of rust. Embellishing with engraving, etching, and silver inlay adds to the beauty of much of the copper work. Business card lies on an oxidized copper switch plate.The tiny bell may have been formed by casting. Traditionally women were not involved in the copper industry because of the great upper body strength needed for hammering with sledgehammers and other heavy tools. In the late 1970’s, jewelry artist Ana Pellicer began teaching women to make copper beads, and this skill allowed them to grow into copper artists in their own right. Shiny copper doors led into a courtyard where a demonstration forge was set up. Kids loved working the huge bellows! This way to the men’s room. Sinks in the public restrooms are also copper! 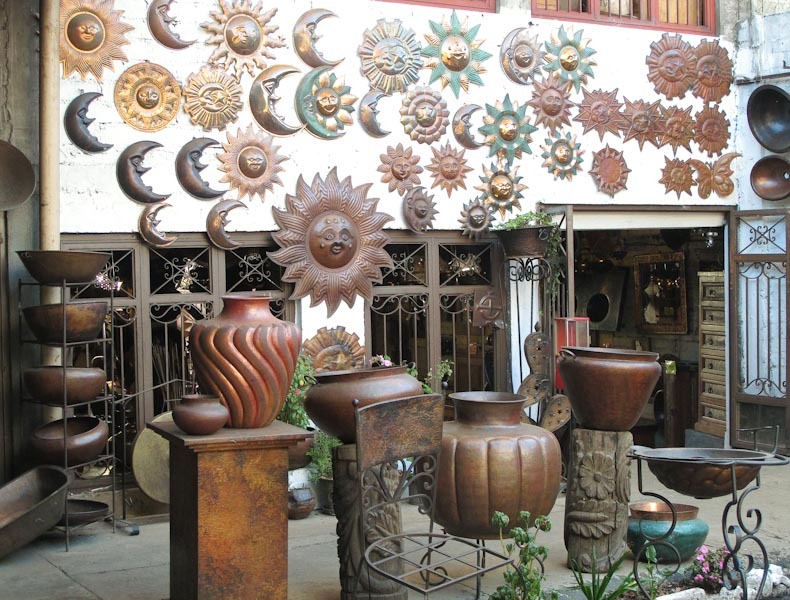 Copper shops surround the town plaza, and booths overflowing with copperware fill the center. Shopper’s heaven. Will any of these fit in my carry-on? The porch of an outdoor cafe was the perfect vantage point to watch the vendors showing off their wares and the shoppers trying to decide! 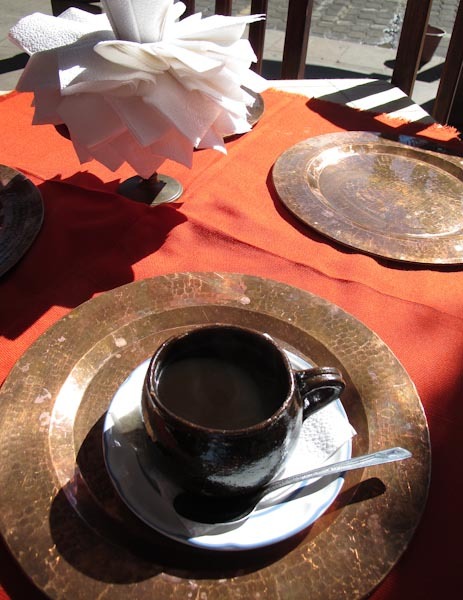 A friendly young waiter set my plate of scrambled eggs with spicy chorizo and tortillas on top of this copper plate. Heated by the sun, it kept my breakfast toasty warm!